How I came to swim amongst the magnificent corals of Ningaloo Reef with sharks, giant turtles, stingrays, dugongs and endless schools of dazzlingly coloured fish. Everyone knows of the Great Barrier Reef off the east coast of Australia. 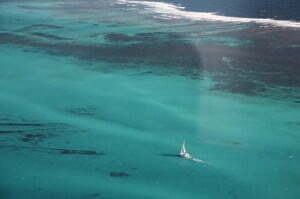 Far fewer know of the Ningaloo Reef off the west coast of Australia. This is surprising given that Ningaloo was awarded World Heritage status and recognized as one of the most spectacular and last remaining pristine coral reef systems in the world. It is home to 220 species of coral and 500 species of tropical fish. 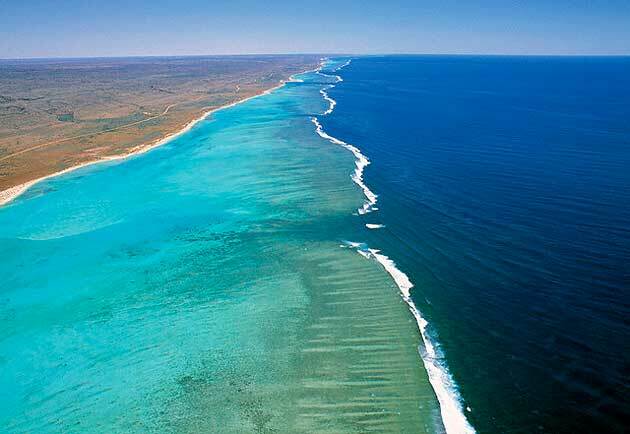 Ningaloo is actually one of the longest near-shore reefs in the world. It hugs a remote and isolated corner of Australia’s rugged north-west coastline. I was intrigued to see a place so rich in unique marine wildlife and yet relatively unknown. I thought the best way to see it was on a boat trip. So I booked myself in for a 5-day sail on a 52’ catamaran operated by Sail Ningaloo. By coincidence, the only other passenger on this trip was another woman, Kate from England, who travels extensively on her own on adventure boats trips to places such as the Arctic, the Antarctic and the Galapagos Islands. She was on the trip to do a lot of diving on the reef. I chose to snorkel. I had never gone snorkeling before, but that didn’t matter. The crew showed me how to get into the wet suit and use the snorkel, slip over the boat and follow their lead underwater. The turquoise waters were so immaculate, that valleys of exquisitely shaped coral were clearly spread out before me. And swimming all around me was an ever-changing and wondrous flow of fish of every size, shape and colour. I have always loved seeing huge green turtles in nature documentaries. Now I was so excited to be able to swim in amongst groups of them and even get to within a meter of some of them. Until they realized I was there and flapped their fins and scurried away. Approaching two dugongs was very thrilling as these strangely shaped creatures are quite difficult to sight. But swimming with the sharks and stingrays was much scarier. I was told that the reef sharks are not interested in humans, but when several of them sped towards me, I froze in the water, until they swam by. The stingrays are much harder to spot, as they lie buried in the pure white sand on the bottom, then suddenly rise up, shake off their sand covering and quickly propel themselves away. While lounging on deck, we watched whales swimming by, shooting streams of water through their blowholes. The white whales and humpback whales were on their annual migration through the 6000sq meter area of the Ningaloo Reef. One day, a mother humpback whale and her baby came right up to the boat. Kate and I stopped talking as we thought it would frighten them off, but just the opposite. The more we talked to them, the closer they got, until the mother whale swam under her baby and lifted him up on her back to give him a better look at us. They are highly intelligent and curious animals. I was able to snorkel twice a day and yet each day I saw completely different arrays of coral formations, crustaceans, mammals and fish. When not underwater, I lay on the deck and read, frequently looking up to spot whales, Manta rays, dolphins or turtles. The best part of lying in the bunk in my cabin, was watching the sunrise light up the sea outside my porthole. This is a woman-friendly tour. Even though I was doing things I had never done before, I felt safe, comfortable, and was not made to feel awkward or out of place as a woman traveling on my own. It was a very good way to access and enjoy the exceptional beauty of this part of the world. Single supplement: it is sometimes waived for last minute bookings on a confirmed tour. Sail Ningaloo recently won a Silver Award for Ecotourism and a Bronze Award for Adventure Tourism from Western Australia Tourism. Go snorkelling and swim with dugongs, turtles, stingrays, sharks and gloriously coloured fish in amongst stunning coral formations. Take a look at the video footage. Thanks to Sail Ningaloo and Prue Johnson for the underwater photos and video footage. Editing by Augustine Zycher. Ningaloo Reef looks absolutely amazing. I must get a close look at these corals and fish. I will head there as soon as I can and take a look for myself!